Rainwater Tanks Direct is owned by Online Water Solutions Pty Ltd which is a family owend company whose owners have more than 12 years experience in the water tank industry. 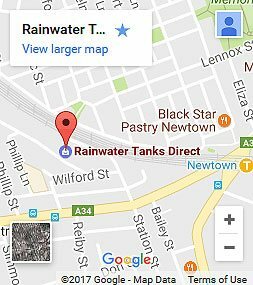 Rainwater Tanks Direct offers the widest range of quality underground and above ground water tanks in the Australian market. These tanks are supplied by over 20 quality water tank manufacturers of polyethylene, aquaplate steel, stainless steel and concrete water tanks, including All Weather Tanks, Aquarius Tanks, Clark Tanks (Dalby, Bathurst and Moama), Compass Steel tanks, Graf Plastics, Heritage Water Tanks, Kingspan Tankworks Steel water tanks (Brisbane , Sydney and Melbourne), National Poly Industries, (Bundaberg and Bathurst), Nylex Water Tanks, Poly Water Tanks, Plastic Tanks Queensland, Rotadyne, Rotoplas water tanks, Rotoplus water tanks, Select Stainless Steel water tanks, Statewide Concrete Tanks, Supatank, Sydney Water Tanks, Tankmasta water tanks, Tanks Direct and Team Poly. We also sell pumps suitable for use with these water tanks from Australia’s best pump compnaies: Bianco , Claytech, Ascento, DAB, Davey and Grundfos.